How Warren Buffett Identifies Value Stocks to Invest? Four most powerful tools that Warren Buffett uses to identify value stocks. If you understand them all then you can easily pick value stocks for wealth creation. 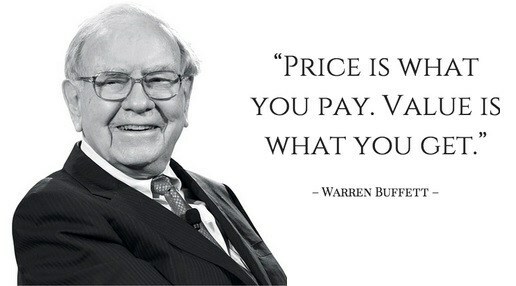 Warren Buffett Intrinsic Value investing formula technique is shared below. Suppose you are sitting in a beer bar with some of your friends. While drinking the beer you got idea to start your business. The business of printing T-shirts. It requires ₹1,000 to open and start that business but you have only ₹250. You convinced one of your friends sitting with you and he is agree to pay you remaining ₹750. ROE ( Return On Equity) : Many people don’t really understand the real meaning of ROE, they just say, divide net profit to shareholder’s equity and your ROE is ready. I am not saying they are lying but the fact is you need to understand the terms so that you can use it in your analysis part. Return on equity measures a corporation's profitability by revealing how much profit a company generates with the money shareholders have invested. The ROE is useful for comparing the profitability of a company to that of other firms in the same industry. It illustrates who effective the company is at turning the cash put into the business into greater gains and growth for the company and investors. The higher the return on equity, the more efficient the company's operations are making use of those funds. Return on assets (ROA) is an indicator of how profitable a company is relative to its total assets. Here is a twist, Remember that a company's total assets is the sum of its total liabilities and shareholder's equity. Both of these types of financing are used to fund the operations of the company. Since a company's assets are either funded by debt or equity. The company has no retained earnings so Reserves and Surplus would be zero. A higher ROA represents how efficiently the company is using its total asset in its core business to generate profits. ROA is most useful for comparing companies in the same industry, as different industries use assets differently. Return on capital employed (ROCE) is a financial ratio that measures a company's profitability and the efficiency with which its capital is employed.Here Capital Employed is not the total asset, this capital is the total capital that has been used to generate profits in the company. For a company, the ROCE trend over the years is also an important indicator of performance. In general, investors tend to favor companies with stable and rising ROCE numbers over companies where ROCE is volatile and bounces around from one year to the next.